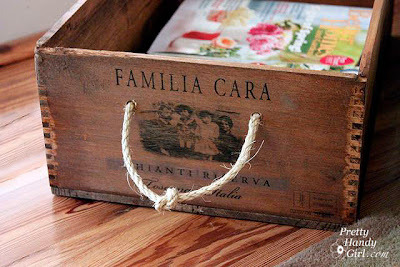 Jackie Fo: Wooden Wine Crates DIY! It's the best day ever - the Friday before a long weekend! Three glorious days are ahead of us! My goals? I plan to do a few DIY projects around the casa (some painting is in my future), write a few articles and catch up on a long overdue stack of magazines. I've also got a date with my bed to catch up on my zzz's. Doesn't this all sound lovely? After a lot of traveling, I'm thrilled to chill. Now that you have my weekend schedule down pat, let's talk about today's fabulous topic! I had a floral meeting with one of my fall brides Alley yesterday. Alley is incredibly organized, detail oriented and creative. She's a perfect day-of-coordination client because she has thought of everything, which makes my job WAY easier and ensures that I'll be able to make her big day go smoothly. Plus she's absolutely awesome, super energetic and hilarious and we've become good friends-a wonderful perk to my job. 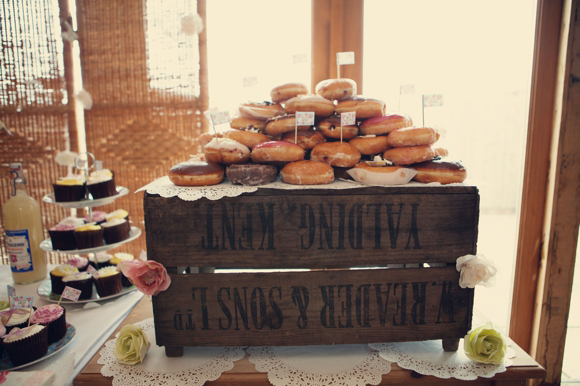 One of Alley's creative ideas is using wooden wine crates at her dessert table to add different heights and an overall rustic look. After checking out these wine crates, I wanted to see what else you can do with these neat looking crates. So if you're wondering what to do with all your empty wine crates after you've imbibed it's contents, look no further! 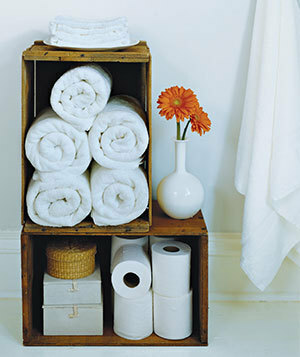 Bathroom Shelving - Who knew your towels and toilet paper could look so purdy? 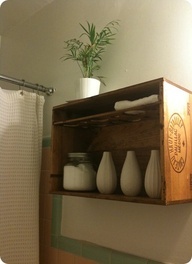 They do in these wooden crate shelves which can be hung on the wall or stacked on the floor! 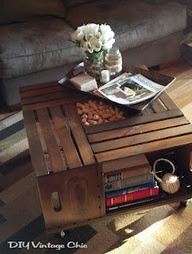 I'm kind of obsessed with this creative wine crate coffee table complete with storage shelves on the side! Who thinks of these things?! If your living room, bathroom, kitchen table, bedside table, etc...is overrun with magazines (Ahem, I'm talking to myself), why not store your glossies in a stylish wine crate? I may attempt this project over the long weekend if I can fit it into my packed schedule. 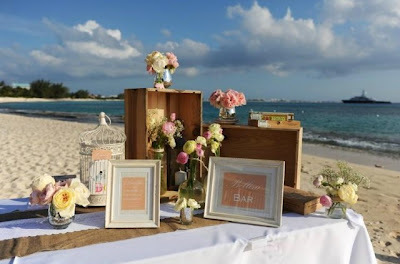 Of course I wanted to see how you can use these crates for events, because events are my jam. 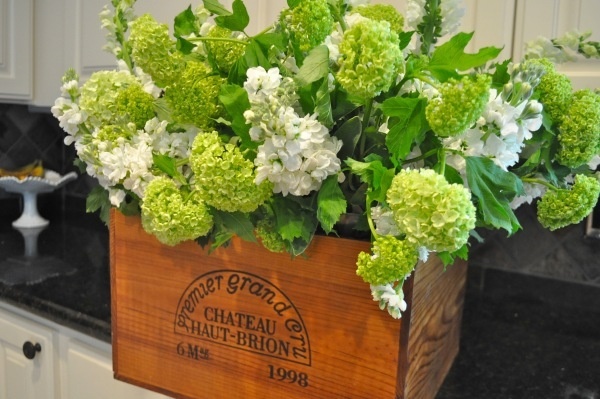 I love flowers in unusual vessels, and there are plenty of gorgeous images that use crates as an alternative to a regular vase. This centerpiece with the candles is stunning. 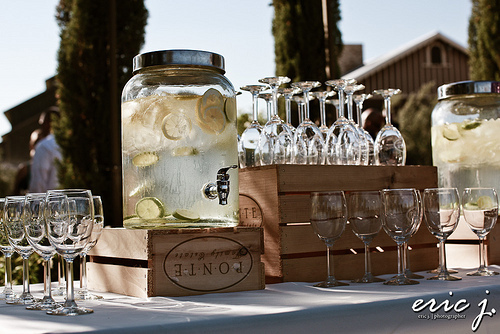 It would be perfect for a vineyard wedding. 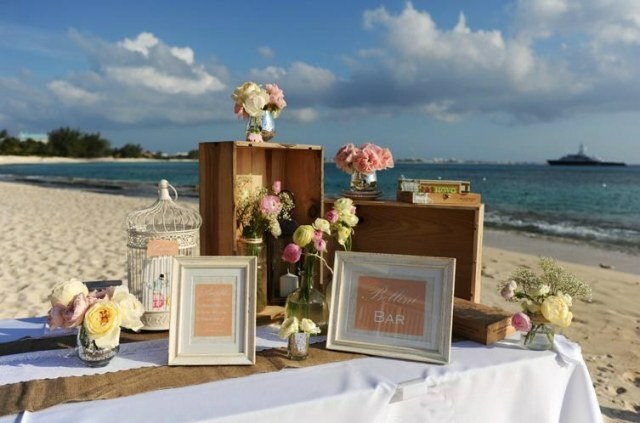 This beautiful beach backdrop almost doesn't need any extra decoration, but a Bellini bar accented with wine crates certainly doesn't hurt! It just makes sense to use crates for a drink station. I love the look off this! How about a rustic donut display? This is gorgeous! 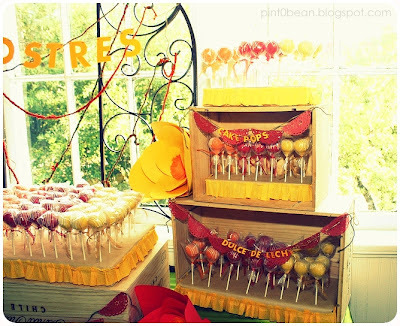 The wine crates showcases cake pops really well too, which is always a challenge! 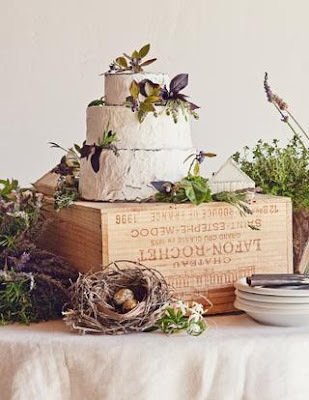 This rustic cake station using the wine crate as a cake stand is just beautiful! It would be great for a rustic cheese display at a wine/cheese party too! With chalkboards? I'll be experimenting soon! 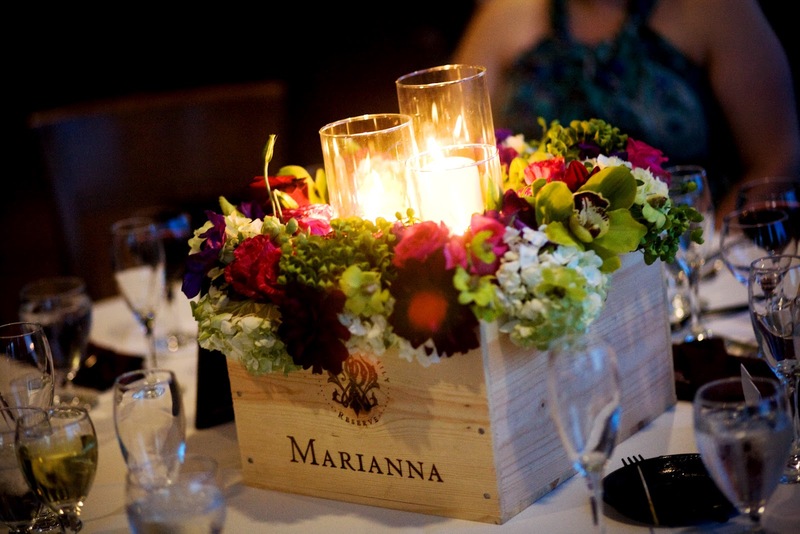 This is a beautiful collage that has tons of examples of wine crates used as centerpieces. So gorge, right? I especially love the painted blue create. The possibilities are sky high! This makes me want to run to my local wine shop and steal as many crates as they'll let me! Good thing my wine shop is in walking distance from my house and knows me by name, face and preference in wine... I basically have a VIP Frequent Visitor Card. Don't be jealous. 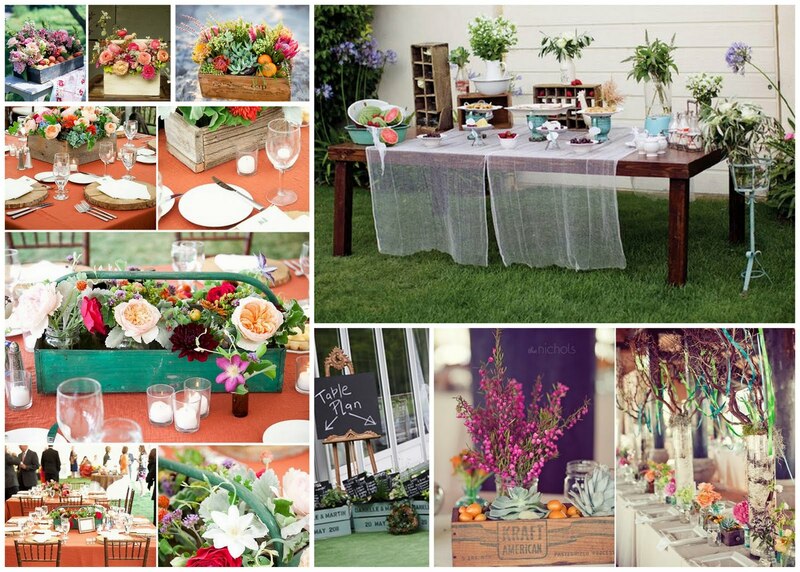 If you're having an event, or just feel like being creative, see what you can do with these rustic wooden crates! I hope you have an awesome long weekend! So many fun ideas! Though my favorite part would probably be drinking the wine just to get the crate! I love these crates- great ideas on how to display them! This is a very interesting blog .Ashapura Saw Mill is one of the leading reputed manufacturers, suppliers and exporters of Wood packaging products, wooden storage Boxes, Wooden packing crates, Plywood Boxes and other wooden packaging solutions. Wooden Crates. Love the wine crate displays! The table on the beach is just so picture-perfect. 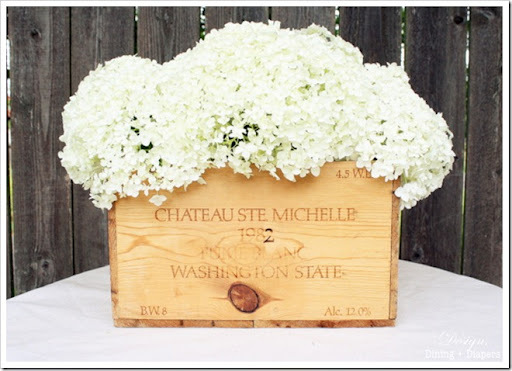 Hello - I'm just now finding your site as I search for wine themed centerpieces. 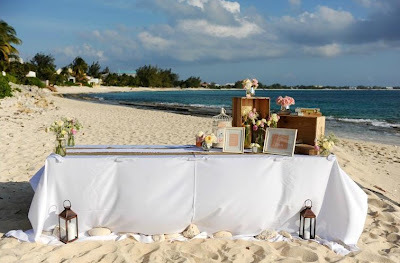 Do you recall what size crate you used for the wedding reception design with the candles? It is absolutely gorgeous! At this stage, complex operations will prove the talent of the winemaker (dissolution, extraction, excretion, diffusion, decoction, infusion).